Rampant, smothering, hairy perennial, climbing up to 12 m high. It has brilliant blue, trumpet-shaped flowers in summer. Flowers Bright blue, large, open trumpet-shaped, up to 10 cm in diameter, in few-flowered axillary clusters, new flowers opening daily and fading to pink in late afternoon. Flowers Jan-Dec.
Fruit Very rarely fruits in NZ. Leaves Deeply three-lobed, up to 18 cm long by 16 cm wide, silky-hairy underneath. Terminal lobe egg-shaped, lateral lobes broad and uneven. 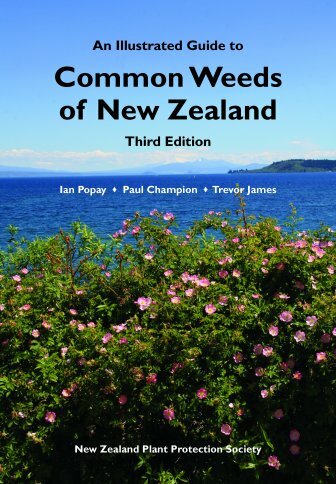 Gardens, waste places, forest margins and plantations. Occasional throughout frost-free lowland NI, rare in northern SI. Originally from tropical regions. Extremely attractive tropical plant grown for ornament, and now growing wild in many places. Listed on the National Pest Plant Accord (see Introduction for details). 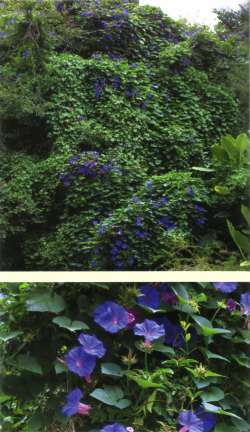 Ipomoea (Gr.) = worm-like; indica (Lat.) = of India or the Indies.